The presidential election of 1920 was one of the most dramatic ever. 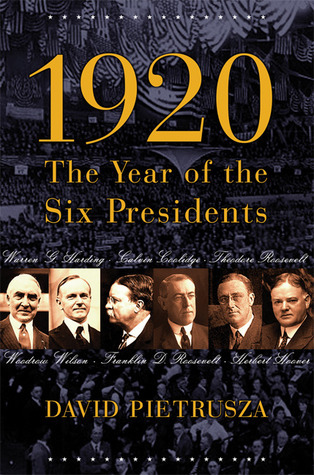 For the only time in the nation's history, six once-and-future presidents hoped to end up in the White House: Woodrow Wilson, Warren G. Harding, Calvin Coolidge, Franklin Delano Roosevelt, Herbert Hoover, and Theodore Roosevelt. It was an election that saw unprecedented levels of publicity — the Republicans outspent the Democrats by 4 to 1 — and it was the first to garner extensive newspaper and newsreel coverage. It was also the first election in which women could vote. Meanwhile, the 1920 census showed that America had become an urban nation — automobiles, mass production, chain stores, and easy credit were transforming the economy and America was limbering up for the most spectacular decade of its history, the roaring '20s. Award-winning historian David Pietrusza's riveting new work presents a dazzling panorama of presidential personalities, ambitions, plots, and counterplots — a picture of modern America at the crossroads. Woodrow Wilson went from President of Princeton University to President of the United States in 1912 and led the country during World War I. Warren Harding of Ohio promised a return to normalcy, which evidently meant corruption and complacency. Franklin D. Roosevelt overcame polio to become president during the Great Depression and World War II. Herbert Hoover made a fortune in mining and organized aid to Europe after World War I, but is now most remembered for not having prevented the Great Depression. Theodore Roosevelt was a progressive political leader, conservationist, war hero and adventurer. It took a long struggle that succeeded in many individual states before voting rights for women were granted nationally by the 19th Amendment in 1920.